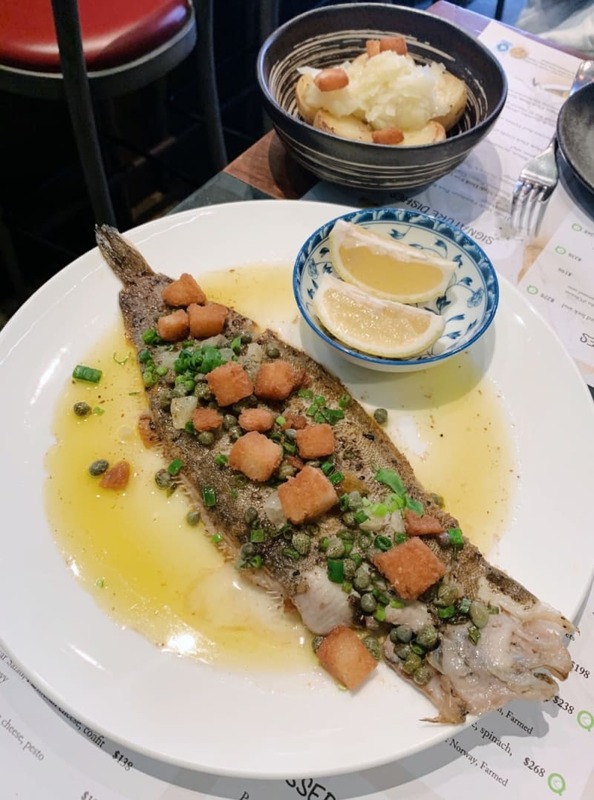 When I think of Hong Kong’s dining scene, I generally think of a handful of old-school famous places (high or low end), a revolving door of trendy new restaurants and various cheap and cheerful local delights. Small, cosy bistros generally don’t come to mind. But that’s not to say they don’t exist. 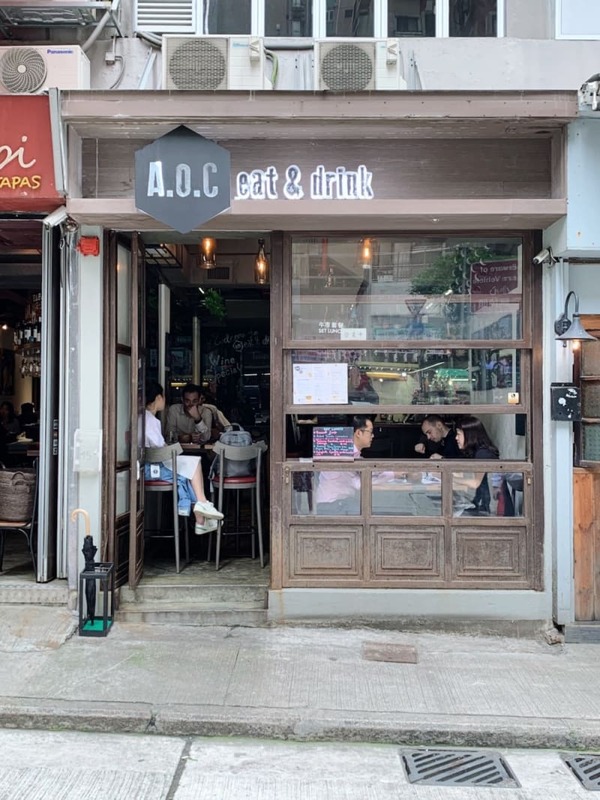 Recently, I had the opportunity to try A.O.C eat & drink, little sister to Le Bistro Winebeast, on a street right beside bustling Lee Tung Avenue in Wanchai. You may be wondering what “A.O.C” stands for. Turns out it’s “appellation d’origine contrôlée”, which is a special French certification to ensure the quality and integrity of products such as cheese, wine and butter. Given that these are some of the core aspects of French cuisine, I was excited for what was to come! The menu changes with the seasons, but it’s always crafted by Stéphane Guillas, a Brittany-born chef who focuses on simple French dishes with a twist. On this visit, we were checking out his new Fish Bar menu for spring. A.O.C has formed a partnership with Qwehli, a Paris-based fishmonger, to ensure it has a regular supply of fresh, responsibly sourced seafood. So what’s on the new menu? 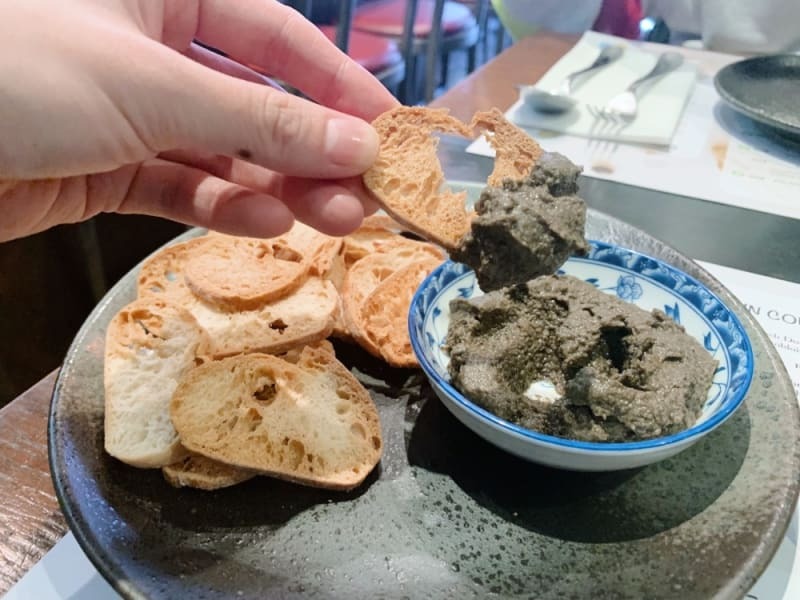 We started with the tapenade with crackers ($68). The olive-based spread was rich and salty… and spicy! This light starter packed a punch. Who can resist a plate of oysters? 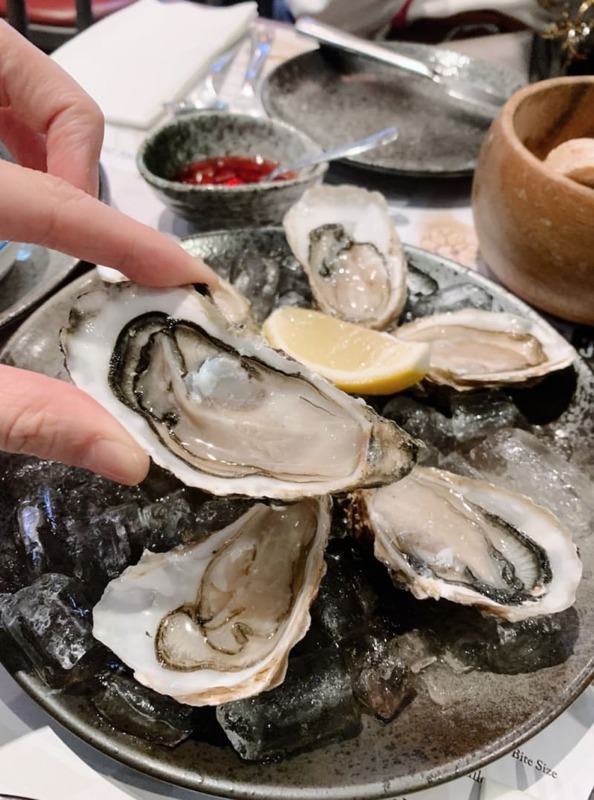 These Fine de Claire oysters ($128 for 6) were juicy and fresh, served with lemon wedges and red vinegar with shallot. 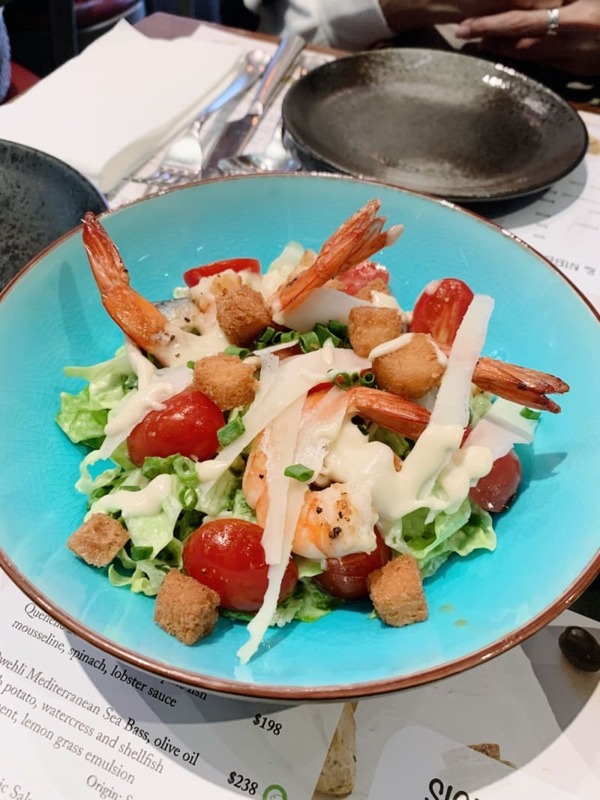 The prawn Caesar salad ($138) came as a large serving that was plenty for two to share. It was packed with tasty ingredients, from large slivers of Parmesan, to fatty anchovies, to perfectly cooked prawns. 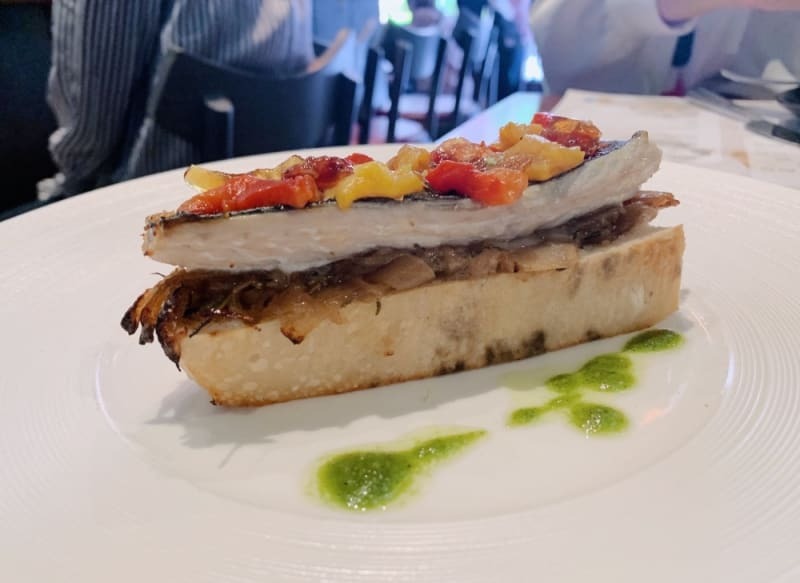 Given that the grilled mackerel on focaccia ($138) is such a huge portion, it’s great value (and tasty too). The red bell peppers and onion confit were cooked in a way that toned down their sharpness, leaving sweet and light flavours to complement the oily fish. The only downside was that the focaccia was a bit difficult to cut, so we ended up using our hands. How beautiful is this French Dover sole ($278), from Les Sables-d’Olonne and fished by trammel, with grenobloise sauce? Perfectly cooked, drowning in buttery sauce and served with a simple bowl of potato with leek. 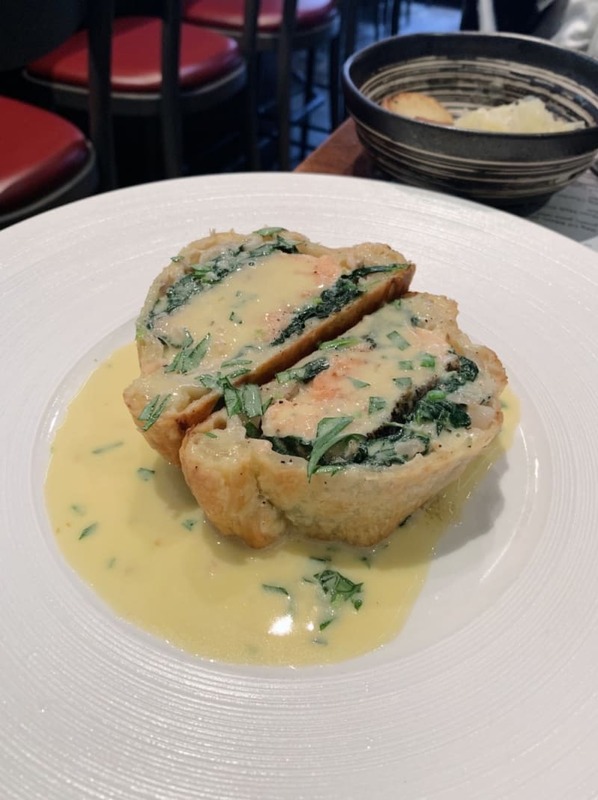 While we were quite stuffed at this point, we couldn’t resist trying the Atlantic salmon coulibiac ($268), farmed from Norway, with spinach, mushroom and sorrel sauce. This dish was quite heavy, but even as part of a meal of very satisfying dishes, this one stood out as my favourite. The salmon was well cooked, the sauce was indulgent and the pastry was so wonderful – slightly crisp, but with good flavour and chew. It tasted refined, but in a “like Mum used to make” kind of way. A.O.C has some wonderful dishes on its new Fish Bar menu. While the prices, especially for the mains, are on the higher side for a casual restaurant, you get what you pay for. The quality of the fish and produce is excellent, and the comfort-style French food is delicious. An alternative would be to check out the restaurant at lunch, where they have great-value set-lunch specials ($120), to include soup or salad and a main.